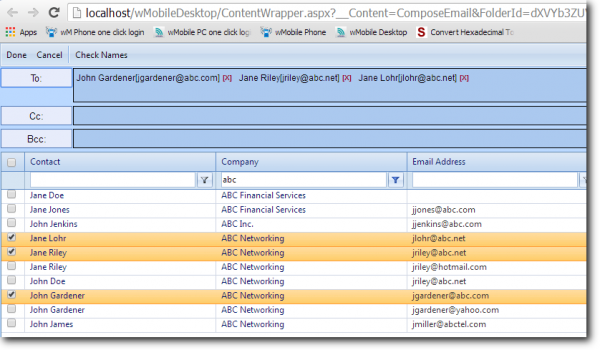 Many of you will be familiar with searching for email addresses in wMobile Desktop. 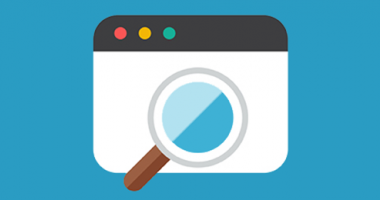 When you click on the To or CC options that are underlined and highlighted in blue, you can select Address Book to search for GoldMine contacts and their email addresses. 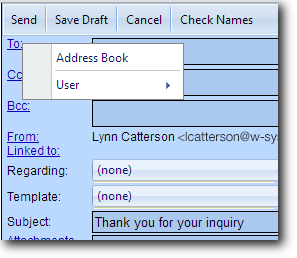 The Address Book will bring up a search tool where you can search by contact name, company, email address or Phone. One or more contacts can be checked in the results. Click on the To or CC buttons to add the contact email address(es). Then click Done to go back to drafting the email message. Any potential matches will be displayed (Primary or Additional contacts). 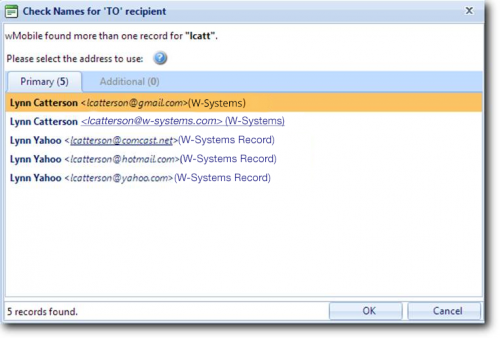 Email addresses marked as primary will be underlined, so they’ll be easily identified. Once an email address is selected, there’s an icon showing that the email is linked. 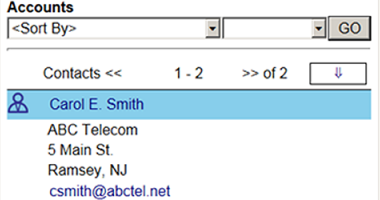 The ‘Linked To’ field will also display the contact to whom the email is linked. 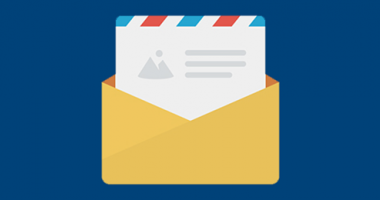 The chain link icon will provide a visual cue to confirm that an email is linked. If there’s no chain link icon, the email message will not be stored in GoldMine History. If the chain link icon is displayed, then the email message will be stored in GoldMine/wMobile History. 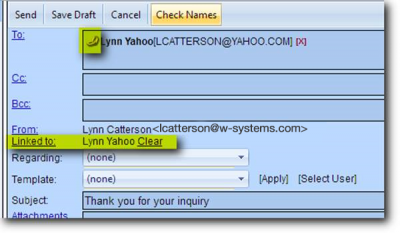 The Check Names functionality should be used if an email address is automatically filled in by the internet browser, or any time you don’t see the chain link icon. 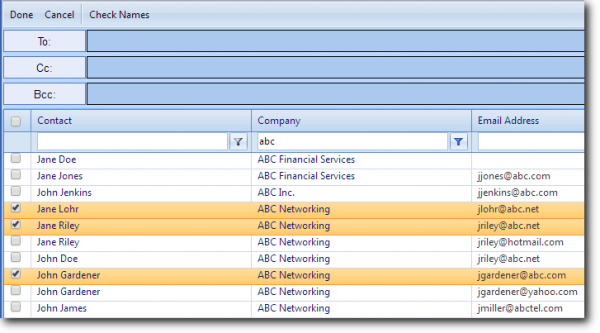 Another method of selecting email addresses is to use Most Recent Recipients’ list which appears in the left pane when composing an email message. 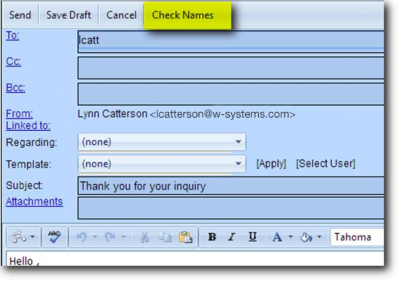 Double-click on the recipient in the list to add it to the To field of the email message. 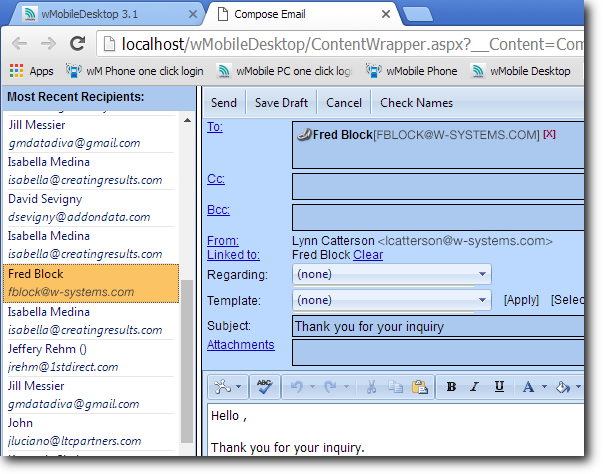 We hope you’ll find these useful tools for composing email messages. 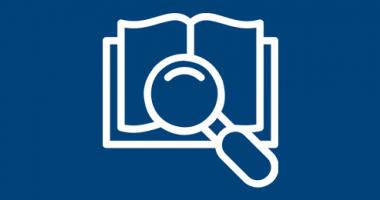 This article pertains to any 3.1 wMobile implementation, but the improved Check Names functionality showing the chain link icon to distinguish linking status pertains to 3.1.4.436 or above.